You have to watch out for punny people and their quicksand wordplay. They will try to pull you in. Going back to Thomas' original point. I remember being a kid, and feeling like everyone had a 72% chance of being stuck in quicksand at least once in their life. Quicksand was a constant plot device in movies and tv. In The Princess Bride it was found in the Fire Swamp, and they called it Lightening Sand. There was desert quicksand in Lawrence of Arabia. In The NeverEnding Story quicksand was found in the Swamp of Sadness. Even K.I.T.T. wasn't immune to the quicksand danger. Last night we were watching old episodes of Nancy Drew from the 1970's. Nancy and George were walking through the woods, looking for a car that disappeared, and George suggested with a fearful voice, "Maybe there is quicksand down there, and it sunk." I remember many heroes who only survived because of a strong tree limb or a well-placed vine hanging down exactly where they could reach it before the quicksand swallowed them completely. Kids on the playground offered advice like, "When you get stuck in quicksand, don't struggle too much. Make small movements. The more you move, the faster the quicksand will swallow you." We all nodded our heads gravely, and reminded each other that vines couldn't always be trusted. We were sure that it couldn't be too many more years before the quicksand caught us, but it never did. At least, it never caught me. I can't vouch for the safety of my entire elementary school class. It could be that I am just part of the lucky 18% of people whom quicksand has not tried to swallow. Did you have quicksand concerns when you were a kid? If you aren't curled up in a ball, trying to pretend that quicksand doesn't exist, you could check out the time I narrowly escaped being killed by quicksand just to get a picture for you. I had forgotten until you posted this! But I now I remember the same kinds of discussions and advice on the playground. We also used to pretend that our (sand-covered) playground was quicksand and that you had to climb across the jungle gym without touching the ground. We played that, too!! Now kids are all about the lava advice. Not that any kids I know live near an actual volcano. I'm not sure if I should say, "I'm so happy I could bring that fearful moment back to you," or if I should say, "Don't worry Ashley, the quicksand is not coming to swallow you." Ha! Those kind of conversations happen every day at my house! Right? I grew up in a house that had woods behind it, and I was always sure one day I would take a wrong turn, walk down a trail I didn't know, and end up in quicksand. Oh my gosh!!! This is hilarious! I thought I was the only one!!! My father had me CONVINCED that at some point in my life I would encounter quicksand, like he was preparing me for the inevitable. I thought it was so normal. "Look both ways before crossing the street. Don't talk to strangers. Watch out for quicksand." Oh my gosh Tracy, I must be part of the lucky 18% of people whom quicksand has not tried to swallow too. But I think it's more than just luck. I've had a tremendous amount of training on what to watch for. For example, never pull your car over to the side of road. You never know, quicksand might be there ready and waiting to swallow up your car. I remember having a quicksand fear too...because TV always made it look like if you touch it YOU DIE immediately! lol! 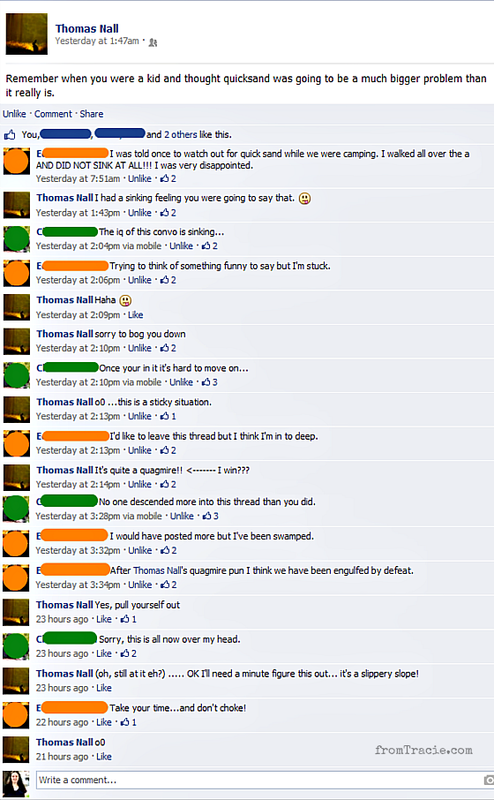 That was a fun Facebook thread, how clever of all of the participants! You guys have such clever friends! I remember playing a lot of quicksand games on the playground as a kid. With the preschooler, it seems to be that hot lava is the game of choice these days.. I really liked the guy's comments who was blocked out by orange. Yellow may have been a better color for him though.